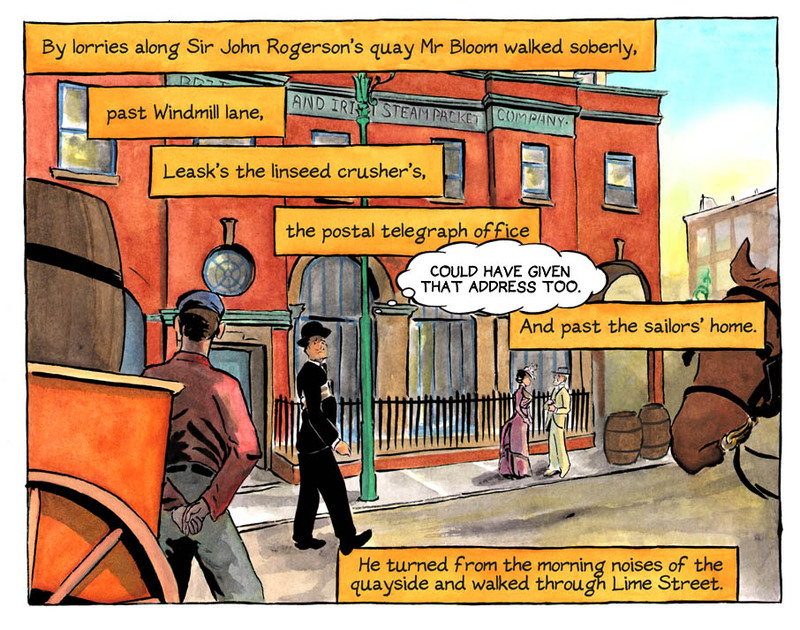 New readers, through no fault of their own, are often convinced that these same qualities that make ULYSSES such a compelling work also make it stand outside their comprehension. Thatâ€™s a damn shame and one of the main reasons we decided to make it into a comicbook: so that new audiences might find an easier way into the experience of reading the novel. 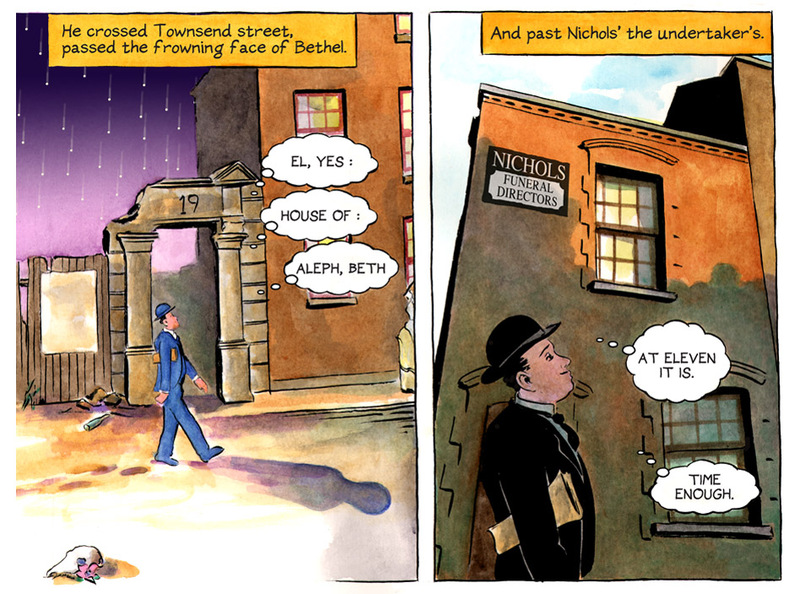 I enjoy making the comic and having people tell me how much itâ€™s helped them understand Joyce. Hell, I live on praise like that. 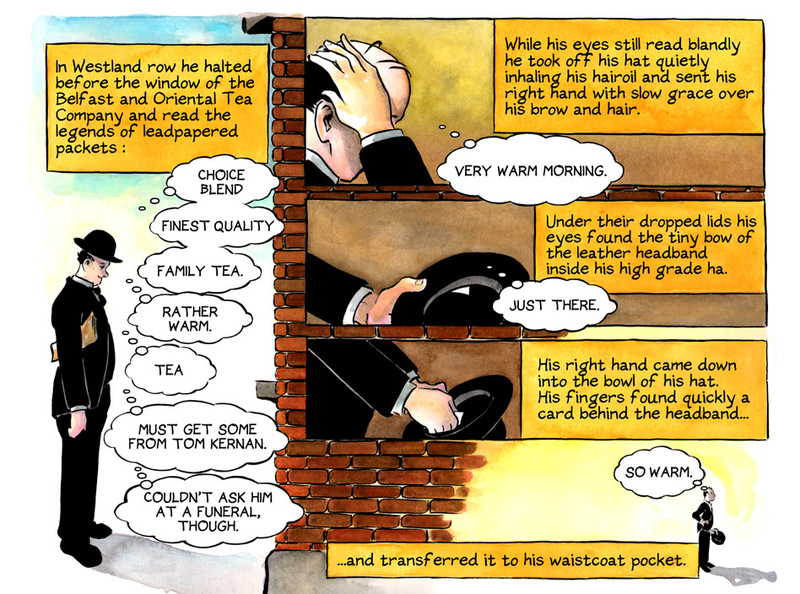 But the real truth is that a comicbook will not help you much in Joyce studies. 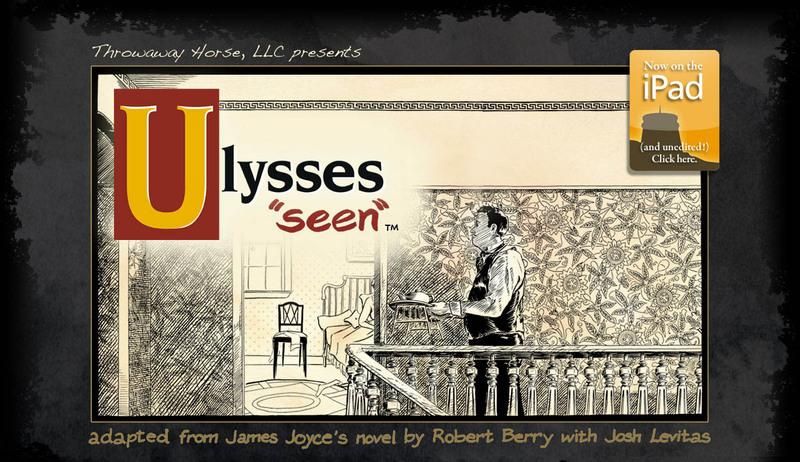 As faithful and reverent of the original text as I might try to be, ULYSSES â€œSEENâ€ is a separate work of art, an adaptation of the novelâ€™s language and events into a completely different artistic medium. The choices made in accomplishing that are largely my own and come from my personal feelings about the novel rather than a catalog of the many theories in Joyce studies. No, we donâ€™t so much offer you a life preserver or even a set of inflatable water-wings on your dive into the deeper Joycean waters. Having a comicbook to look at is more like someone offering to row alongside you with a parasol to keep the sun off your back while you bravely swim the channel. Very nice to have someone there rooting for you the whole way, but it doesnâ€™t make the actual swimming any easier. 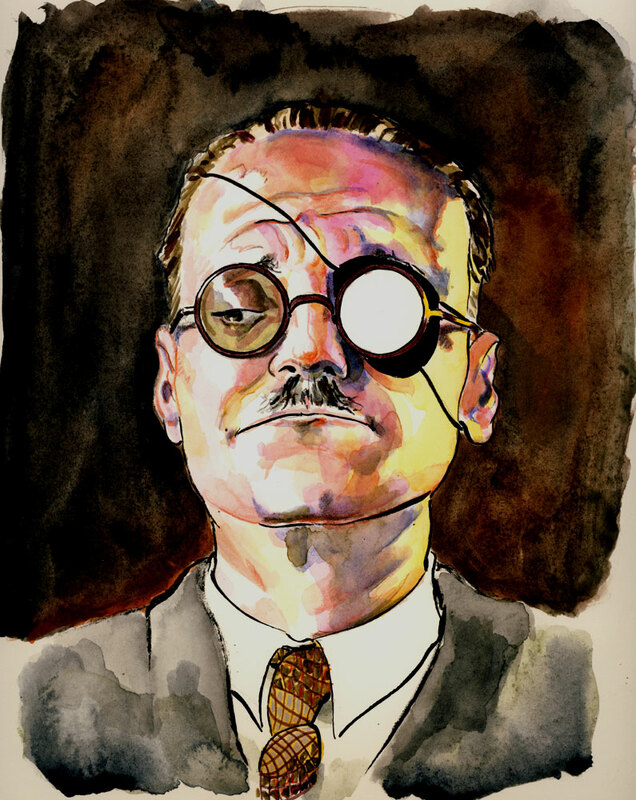 What our project does accomplish quite well however is providing an easier web-based way to get behind, or under, the text to all those theories and complexities that make Joyceâ€™s novel so endlessly challenging and funny. Because of the shape of digital textbooks, each drawn page of the comic has a complete Readersâ€™ Guide to help unpack some of those arguments and in-jokes. Written by prominent Joyceheads like Mike Barsanti and Janine Utell, it lets first time readers get a sustained and ongoing classroom environment for learning the novel. The Readersâ€™ Guide includes translation keys to the numerous languages Joyce employs throughout the novel and allows for a complete question and answer section following each topic. In this way, everyone gets an opportunity dive into the deeper waters and feel like theyâ€™re not alone. 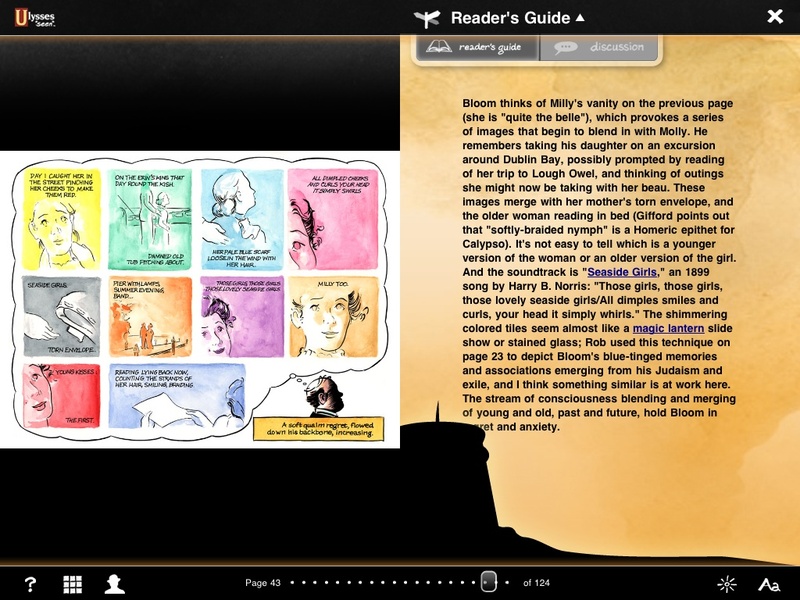 Currently weâ€™ve got two chapters of the adaptation online and available on the iPad. Certainly that may sound like just a cautious toe-drag to test the temperature of the deeper waters of this novel. But I think 128pages of comics to adapt 36pages of text is a pretty daunting average. Weâ€™ll be at this task for some years to come and I hope Joycefans both fresh and well-seasoned, will join us on the website and in the discussions and follow us on the long journey home to â€œPenelopeâ€. Weâ€™re working on two new chapters for release next year, â€œNestorâ€ and â€œLotus Eatersâ€. When I heard about Modernist Version Projects â€œYear of Ulyssesâ€ I knew Iâ€™d want to do something regarding those two chapters. So with that in mind, Iâ€™ll be on the #yearofulysses twitter chat all day today, August 15th, discussing the stickier points of adapting these chapter. There will be plenty of artwork to link to and, I hope, lots of insights from readers on just how things should look. Iâ€™ll defend what decisions Iâ€™ve made, answer what questions I can and genuinely be glad for whatever help any of you might bring me. And thereâ€™s likely to be some fun Joyce quotes along the way. 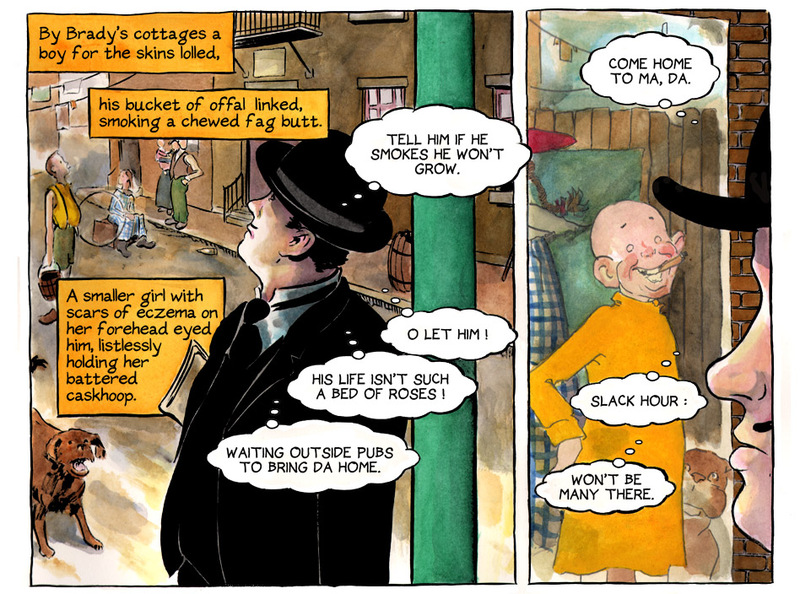 But for now, letâ€™s leave all of you at Year of Ulysses with a few as-yet-unseen pages from â€œLotus Eatersâ€ to get things rolling.